Friedrichstrasse is the perfect amalgamation of the glorious 20s that Berlin witnessed and the representation of modernization that it is today. 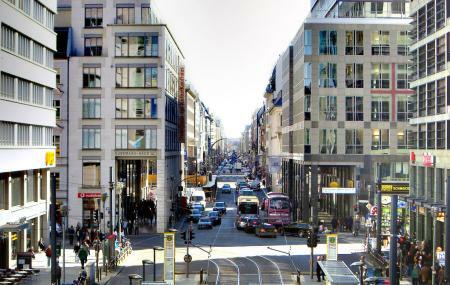 It is a lively street which is often frequented by Berliners as well as tourists. You have a string of restaurants, shops and cafes here where you can get the perfect feels of Berlin. This like a few more areas, is the interacting point of Berliners with tourists who want to get a taste of the culture and lifestyle of the city. Depends on what you buy. Please confirm the timings of any particular shop or restaurant that you want to visit. You can take the U- Bahn to the Friedrichstrasse station. People normally club together Bode Museum and Neue Synagoge while planning their visit to Friedrichstrasse. Decent station in Berlin. There are 2 McDonald's locations in the station (front end and one by the bathrooms/WCs). WCs are 1 Euro to use, and you receive a 50 cent coupon on a minimum purchase of 2.50 or more in the shops located in the station. Inside, there is also a Vitalia (health product store), an Edeka (supermarket), a shoe store, a bakery, and some other useful shops to purchase food, Sim Cards, toiletries, etc. The DM and Rossman outside the station both close at 10 pm on weekdays (instead of the usual 8-8:30). Super nice station with connections to so many places. Also close to airport. Very big station with a lot of transport connections and different types of transport. You can change your trip here to S-Bahn, U-Bahn, fast and comfortable regional trains, tram way and to the buses of course. It’s located almost in the center of Berlin between the best streets of this city. Very interesting to go away from this station, just walk around and then turn back and to go any place you need in Berlin very fast and comfortable. By the way here’s a lot of cafes and stop’n’go points with food located.